A free tool that greatly simplifies documenting BizTalk installations and their associated applications. I don’t like to generalise but most developers I have met are not keen on writing documentation and having recently finished a piece of integration work using BizTalk 2010 I was delighted to find an automatic documenter on the open source CodePlex site. Unfortunately it did not work properly on the environment I was using so I downloaded the code and gave it some tweaks and enhancements. 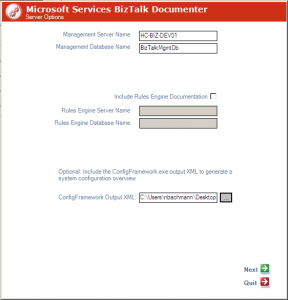 Having tested it, successfully documented projects at work, I have uploaded the now BizTalk Server 2010 Documenter to the same site and hope that some of you may find it of use. This entry was posted in Freeware, Software, Techno Freak and tagged BizTalk Server 2010 Documenter, BTS, CHM, CodePlex, Compiler, free, freeware, Generator, HTML Help, software, tool, User Guide by RedEyedMonster. Bookmark the permalink.